The HM-2 Feed and Water Intake and Activity Monitor Systems automatically measure and record the undisturbed, real-time feed and water intake and the feeding and activity behavior of multiple rodents group housed in a standard home cage environment around the clock. The HM-2 continuously monitors feeding and drinking activity at two independent channels (e.g. feed and drink), which has been designed for low spillage, for high standards of hygiene, and for ease of operation and cleaning. The feeding and drinking data is collected without human intervention. The system records the start time of each meal, the amount of food consumed, the duration of the meal, and the finishing time. Activity is monitored cage-wide and each activity interval is recorded as an individual event. Setup configurations allow the researcher to establish the parameters for the experiment, study and session in advance. The system can operate without refilling the feed hopper for up to 4 days typical for 4 rats or more given its 1000 gram capacity. Mouse systems have a 500 gram capacity. All data is collected automatically without disturbing the animal's normal eating behavior. The experiments, studies and sessions are centrally controlled by the HM02Lab application running at a central Lab-PC. The data collection software ensures robust storage of raw data in the HMBase SQL database and data view is available in HMView presenting the data quickly at the researcher's desk for check of experiment results. Data may be extracted via filters to SigmaPlot®, Graphpad Prism® and Excel®, for in-depth correlation with other research. Export facilities to corporate database structures are also available on request. The individual animals housed together in the same cage are identified using ISO FDXB RFID tags, e.g. DataMars®, Pet-ID®, e-Vet®. Tagging is a safe way of identifying individual animals and integrated with MBRose weigh stations and scanners it can secure a fully automated tracking of animals through the entire experiment. 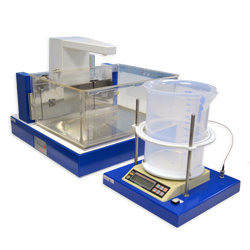 Standard systems are generally sold with 1, 2, 4, 6, 8, 12, 16 or 18 feeding stations and one WS-1 Scale with reader. Additional scales may be added if needed. The lab PC is not included, but can be added if desired. Contact Lafayette-Campden Neuroscience for detailed specifications and pricing. Designed for high standards of hygiene in home cage environment, ease of feed and water filling and cleaning and control of spillage. Full operational control at the HM-2 allows individual experiments to be started and stopped directly from the individual HM-2 station. Simple power and network cable connection to the data network and central Lab-PC. Up to 48 HM-2 stations may be connected through the network to the HM02Lab program at the central Lab-PC. Data collection in HMBase SQL database allows robust collection of information, which is made available by HMView or via interface filters to Excel®, SigmaPlot® and Graphpad Prism®. Simple station validation and tare function from the individual station keypad or system wide from the Lab-PC. Low power units with light dimmer on control and lamps enable easy rack-integration and use in shifted daylight applications. A built in calibration function allows load cell calibration to meet company quality standards.